No film in recent history has had as many hurdles to overcome before paying punters get a chance to see the final product on the big screen. 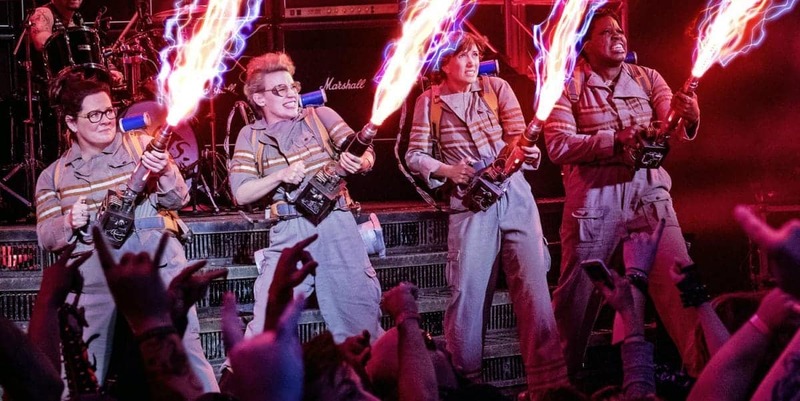 Be it a horrendous marketing campaign or a fanatical anti-Ghostbuster contingent in opposition to the all female cast, the Paul Feig directed flick has found itself in an odd position. For a vocal minority, this reboot would have to be the second coming of Citizen Kane to secure their approval with many wanting it to bomb. Ghostbusters though not perfect, is a damn fun and straightforward blockbuster in a summer that has seen many a big budget franchise collapse under the weight of it’s own lofty ambitions. Paul Feig has spoken at length at wanting to create a new take on the franchise for a younger generation. The option was dangled by Sony Pictures to craft a continuation of the seminal 1984 classic. Instead he and writing partner Katie Dippold took on the thankless task of rebooting this beloved franchise. The choice to go with an all female cast should be commended and it was the right thing to do if the pictures of young girls cosplaying as the ghost hunters are anything to go by. Melissa McCarthy, Kristen Wiig, Kate McKinnon and Leslie Jones take the reigns as the resident parapsychologists in New York providing a dynamic group with very distinct and likeable personalities. Erin Gilbert (Wiig) and Abby Yates (McCarthy) are the leaders of the crew having previously spent years researching the paranormal and are joined by technical genius Holtzmann (McKinnon) and the knowledgeable and streetwise Patty (Leslie Jones). The quartet have an impressive comedic resumé between them and elevate what could otherwise become your average high budget flick if absent. They are introduced to us at pace and the film wastes no time getting the crew together. Once they begin gelling together , they provide a formidable paranormal fighting force and hats off to the choreography and VFX teams for providing some exciting set pieces accompanied by visuals radically different from your average ghost story. Another stand out is Chris Hemsworth as their oafish receptionist Kevin. Whilst his gags may wear thin towards the end, Kevin is great for gut laughs and Hemsworth certainly has a future in comedy if he ever decides to hang up the hammer and cape over at Marvel. Kevin has a far more integral role than has been led on in the marketing and I personally can’t wait to see more of the charming dolt alongside the team. Feig and crew do as much as possible to craft a truly enjoyable couple of hours at the cinema. From effective jump scares to the special effects heavy finale, the film does everything possible to satisfy newcomers and longtime fans. This film wants you to have a lot of fun and pulls out all the stops to ensure you get bang for buck. Now there are problems and most of them are symptomatic of the modern day summer blockbuster. After a rip-roaring introduction to the characters and the tone set, the film comes to a halt in the second act. We spend too much time dealing with the political side of being a Ghostbuster and the air gets pulled out of proceedings. Whilst the jokes land for the most part, those that missed the mark in the trailers flounder here. McKinnon in particular is given some frustration characteristics and jokes – she’ll certain be a love it or leave it type. Speaking of floundering, the cameos are heavy handed and sucked me out of the scenes involving any of the original cast. It was inevitable they’d be included; I just wish the filmmakers had found a more subtle way to integrate them. The villain is also a cookie cutter ‘nerd done wrong’ and never really provides menace. In fact, upon his initial introduction I assumed he was merely a gag – I couldn’t believe he would end up providing the enemy opposition. Though flawed, Ghostbusters is one of the better big budget blockbusters this summer. It may not convert the haters (I don’t think anything could) but those looking for a fun couple of hours at the cinema will walk out with big ole’ smiles on their faces and I for one can’t wait to see where a sequel will go with this talented bunch at the helm. I walked out humming that theme tune. Ben Holliday is a features writer for Den of Geek, What Culture and film critic for The London Economic. As an artist he has worked on various projects for Maverick Media, Bauer Media, Image Comics and Valiant Entertainment amongst others.